ABSTRACT: In the last several decades, some important studies, such as those by Christopher Lewis, Harald Krebs, William Kinderman, and William Rothstein, have explored alternatives to monotonality in tonal music. In this paper, I discuss the concept of peremennost’ (mutability), which addresses the same problem from a Russian perspective. Mutability is generally defined as a fluctuation between two diatonically related tonal centers, usually a third apart. However, this somewhat narrow definition does not capture the notion in all its richness; the concept of mutability evolved significantly over the course of the last century. I explore this concept in the writings of six twentieth-century Russian theorists: Boleslav Iavorskiĭ, Lev Mazel, Viktor Berkov, Igor Sposobin, Iuriĭ Kholopov, and Andrei Miasoedov. Mutability, or peremennost’, generally defined as a fluctuation between two or more diatonically related tonal centers, has been a central concern in Russian music theory that deals with folk and church music, as well as folk-inspired Russian classical music. A typical example of what is often understood to be mutability is given in Example 1 (a Russian folk song), in which the melody implies a motion from C major to A minor. Though the concept of mutability is usually tied to a specific body of repertoire, its conceptualization brings to the fore some crucial features of Russian theoretical thought in the twentieth century, such as a growing concern with tonal centricity and a focus on diatonic church modes. It is crucial to note that Iavorskiĭ and Protopopov never mention triadic implications of melodic notes in these modes. Instead, they concentrate on the functions and behavior of single tones. The defining characteristic of the mutable mode is the changeable nature of tone function depending on its registral position. In mutable mode 1, for instance, the tones G and A occur twice. The lower G is unstable and it gravitates upwards toward the stable A. The upper A is unstable and it gravitates downwards toward G. This means that, at least in theory, the Iavorskiĭ/Protopopov system rejects octave equivalence of function in folk music. (8) Though pitch classes may be the same in any octave, the function of every pitch class (its stability or instability) differs depending on the register. The wording of this passage is remarkably similar to modern English-language discussions of tonal duality in Romantic music and specifically the concept of tonal pairing, which originated in the work of Robert Bailey (1985). (10) Therefore, a comparison between Iavorskiĭ’s and Mazel’s concepts of the mutable mode reveals a crucial change, a paradigm shift in the understanding of mutability, which I would like to call a functionality shift. This means that Mazel brings the notion of mutability into the realm of conventional tonal music and therefore tonal theory and tonal functions. (11) The functionality shift happens due to a difference in repertoire: while Iavorskiĭ’s mutable modes are intended for European folk and liturgical music, Mazel deals with the music of a nineteenth-century composer. Although Mazel specifies that by mutability he does not mean a changing function of specific tones, in fact such a changing function does exist in his mutable mode, though not in Iavorskiĭ’s sense. Example 6 presents my summary of the two views (here, Mazel’s column has been transposed from the four-flat system of Chopin’s Fantasia in F minor to the natural system). The example shows Iavorskiĭ’s four-note tonic of mutable mode 1 and the A–G pair (the black note heads), in which the stable/unstable relationship depends on register. Mazel partitions Iavorskiĭ’s single four-note tonic into two interlocked triads that alternate as tonal centers in the course of a composition. The tones A and G can each be stable and unstable in Mazel’s system as in Iavorskiĭ’s. But for Mazel this function depends on which tonic currently dominates in a musical passage, i.e., on the tonal plan of a work, and not on the note’s registral position. Later, he says about another similar example: “After the appearance of the relative minor (in the form of a one-measure-long tonicization), a concluding modulation to the key of the opening major’s dominant follows” (1948, 61). These excerpts clearly show that (1) a single tone, even in a monophonic passage, always presumes potential harmonization, and therefore a mutable center (or tonic) is a harmony, usually a triad, and not a tone; (2) the mutability of third-related centers participates in the functional dynamics (T, S, and D) and modulatory motions of tonal music; and (3) third-related and fifth-related tonal centers are categorically different kinds of relationships. The concept of mode so important to Iavorskiĭ is still important for Berkov, but for Berkov, only two modes exist: major and minor. (12) In sum, Berkov’s view of mutability is conceptually akin to Mazel’s, but it is somewhat more specific with regard to chordal implication and the contrast between third- and fifth-relations. Another theorist who adopted the term mutable mode was Igor Sposobin, in his textbook Elementarnaia teoriia muzyki (Elementary theory of music) (1994). (13) In a general sense, Sposobin’s idea is very close to Mazel’s and Berkov’s: all these writers share a reliance on tonality and tonal functions and the view of mutability as a change of tonic (usually multiple times) in the course of a piece. (14) This is not the same as the Western concept of modulation; changes in a mutable mode most often occur back and forth between two diatonically related tonal centers, while modulation embraces many more possibilities. (15) For both Berkov and Sposobin, the center of a mode, including a mutable mode, is a major or minor triad, even if harmonies and tonal motion are only implied by a monophonic melody (as opposed to a total absence of triadic implication in Iavorskiĭ). Sposobin’s major innovation as regards mutability is his classification of it into two main types (see Example 8): (1) relative mutability, or relative-mutable mode (parallel’no-peremenny lad), the type that Berkov deals with almost exclusively, and (2) mutability “of other types.” These other types include not only a shift of tonal center in a fixed diatonic collection, but also a change of collection with a fixed tonic. The latter situation may involve a change of mode (from major to minor or the reverse) or a change of mode subtype (i.e., the diatonic modes), which he considers special types of major and minor. For example, Phrygian is minor with a lowered 2ˆ. (16) Just such a change of mode, from A natural minor to A Phrygian minor, occurs in Example 9. Finally, the last row in the table in Example 8 is similar to the relative type (the pairing of relative keys), except that the tonic shifts by an interval other than a third. Thus, notwithstanding the conceptual proximity between Berkov’s and Sposobin’s mutability, Sposobin has a more refined classification and a more clearly expressed view of mode. Although both types of mutability, modal and tonal, have different degrees of decentralization (see Example 10), Kholopov ultimately conceives of tonal mutability as a conceptual mediating phase between tonality and modality. He writes: “The weaker the force of tonal centricity, the stronger the mutability of modes [ladovaia peremennost’] expresses itself in different ways” (1988, 173). (22) In this sense, the further down we move within the left column of Example 11, the closer we approach modality-type modes, since these modes by definition exhibit attenuation of center. Accordingly, Example 13 rearranges Kholopov’s classification of mutability to highlight the continuum between modality and tonality. (If we were to include modal mutability in this scheme, it would be situated on the far left side of the box.) Kholopov's mutability therefore references the principle of decentralization in general. This principle marks another paradigm shift in the history of the concept: the centricity shift. Unlike earlier theorists, for whom mutability always involves specific kinds of key relationships, for Kholopov it is a more abstract idea—the idea of a weak tonal or modal center. Significantly, Kholopov’s concept is the broadest of all in terms of repertoire: his examples include both Russian and Western music, both folk- and art-music examples, the latest of which belong to the twentieth century (Rimsky-Korsakov and Reger; see Kholopov 1988, 175–76). The notion of a shifting or ambiguous tonal center is also important in the work of Andrei Miasoedov, professor of the Moscow Conservatory who recently retired (in 2009). His treatise O garmonii russkoĭ muzyki (On the harmony of Russian music) (1998) explores what it is that makes Russian music harmonically unique. In this work, he introduces the notion of pra-garmoniia (proto-harmony), which, in his view, is the structural foundation of Russian music. Proto-harmony, presented in Example 14, is built on four diatonically related harmonies whose roots can be ordered by perfect fifths. The example shows a gradual historical evolution of proto-harmony from four fifth-related tones, which in ancient Russian folk music were most probably doubled in octaves and fifths (according to Miasoedov), to triads. Even though proto-harmony is Miasoedov’s own innovation, the notion of a shifting or ambiguous tonal center (which might comprise more than two centers, as in Kholopov’s model) brings Miasoedov’s mutability into conceptual proximity with Kholopov’s tonal mutability. Both notions refer to tonality with a weakened tonic, or to multiple tonics that coexist at the same level of structure in the same piece. As a summary of the notion of mutability explored here, I refer the reader once again to the table in Example 2. 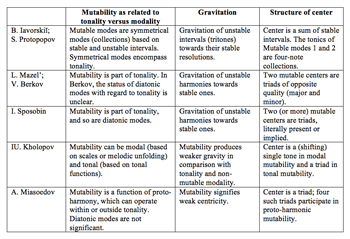 The table shows that the concept of mutability has moved gradually from a tritone-based definition and concrete pitch relationships, through a contextualization in functional tonality, through interaction between major/minor keys and diatonic modes, to a general notion of weakened gravity. It needs to be stressed that even though contemporary English-language writers often limit their understanding of mutability to a single type—the relative type—the idea of mutability cannot be expressed in a single definition. (24) Any such definition would oversimplify the array of meanings that various theorists have attached to it, as well as preclude one from seeing many implicit connections with past and present Western theories of tonality. By offering a chronologically arranged table of mutability’s conceptual development, I do not mean to argue that the authors developed the idea in a conscious effort to produce a unified theory of mutability, or that the historical trajectory shown here was intentional. Rather, mutability is a sort of recurrent theme that comes to light at points where tonal unity is questioned in some way, usually though not always in connection with folk music. An analysis of this recurrent theme, however, reveals the implicit trajectory of the concept and its uses through the course of the twentieth century. Bailey, Robert. 1985. “An Analytical Study of the Sketches and Drafts.” In Wagner, Richard, Prelude and Transfiguration from “Tristan and Isolde”, ed. Robert Bailey, 113–46. New York: W.W. Norton & Co.
BaileyShea, Matt. 2007. “The Hexatonic and the Double Tonic: Wolf’s ‘Christmas Rose’.” Journal of Music Theory 51, no. 2: 187–210. Bazayev, Inessa. 2014. “The Expansion of the Concept of Mode in Russian Music Theory.” Music Theory Online 20, no. 3. Berkov, Viktor. 1948. Garmoniia Glinki [Glinka’s harmony]. Moscow-Leningrad: Muzgiz. Carpenter, Ellon DeGrief. 1995. “Russian Theorists on Modality in Shostakovich’s Music.” In Shostakovich Studies, ed. David Fanning, 76–112. Cambridge: Cambridge University Press. —————. 1995. “Russian Theorists on Modality in Shostakovich’s Music.” In Shostakovich Studies, ed. David Fanning, 76–112. Cambridge: Cambridge University Press. Dahlhaus, Carl. 1990. Studies on the Origin of Harmonic Tonality. Translated by Robert Gjerdingen. Princeton: Princeton University Press. Dubovsky, Iosif, et al. 1987. Uchebnik garmonii [A Textbook of Harmony], commonly known as Brigadnyi uchebnik [The team textbook]. 4th edition. Moscow: Muzyka. Fétis, François-Joseph. 2008. Complete Treatise on the Theory and Practice of Harmony. Translated by Peter M. Landey. Hillsdale, NY: Pendragon Press. Johnston, Blair. 2009. Harmony and Climax in Late Works of Sergei Rachmaninoff. PhD diss., University of Michigan. Hyer, Brian. 2002. “Tonality.” In The Cambridge History of Western Music Theory, ed. Thomas Christensen, 726–77. Cambridge: Cambridge University Press. Iavorskiĭ, Boleslav. 1908. Stroenie muzykal’noĭ rechi [The structure of musical speech]. Moscow. Kholopov, Iuriĭ. 1988. Garmoniia: Teoreticheskiĭ kurs [Harmony: A theoretical course]. Moscow: Kompozitor. Kholopov, Iuriĭ. 2003. Garmoniia: Prakticheskiĭ kurs. [Harmony: a practical course]. 2nd edition. Moscow: Kompozitor. —————. 2003. Garmoniia: Prakticheskiĭ kurs. [Harmony: a practical course]. 2nd edition. Moscow: Kompozitor. Kholopov, Iuriĭ. 2008a. “Ladoperemennost’ kak svoistvo modal’nykh ladov.” [Modal mutability as a characteristic of modality-type modes]. In Idei IU.N. Kholopova v XXI veke: K 75-letiiu so dnia rozhdeniia [The ideas of IU.N. Kholopov in the 21st century: in celebration of his 75th birthday], ed. T.S. Kiuregian, 101–4. Moskva: Muzizdat. —————. 2008a. “Ladoperemennost’ kak svoistvo modal’nykh ladov.” [Modal mutability as a characteristic of modality-type modes]. In Idei IU.N. Kholopova v XXI veke: K 75-letiiu so dnia rozhdeniia [The ideas of IU.N. Kholopov in the 21st century: in celebration of his 75th birthday], ed. T.S. Kiuregian, 101–4. Moskva: Muzizdat. Kholopov, Iuriĭ. 2008b. “K probleme lada v russkom teoreticheskom muzykoznanii.” [Towards the question of mode in Russian music-theoretical thought.] In Idei IU.N. Kholopova v XXI veke: K 75-letiiu so dnia rozhdeniia [The ideas of IU.N. Kholopov in the 21st century: in celebration of his 75th birthday], ed. T.S. Kiuregian, 79–100. Moskva: Muzizdat. —————. 2008b. “K probleme lada v russkom teoreticheskom muzykoznanii.” [Towards the question of mode in Russian music-theoretical thought.] In Idei IU.N. Kholopova v XXI veke: K 75-letiiu so dnia rozhdeniia [The ideas of IU.N. Kholopov in the 21st century: in celebration of his 75th birthday], ed. T.S. Kiuregian, 79–100. Moskva: Muzizdat. Mazel’, Lev. 2008. Issledovaniia o Chopine [Chopin Studies]. Moscow: Kompozitor. McQuere, Gordon. 1978. “‘The Elements of the Structure of Musical Speech’ by S.V. Protopopov: A Translation and Commentary.” PhD diss., The University of Iowa. McQuere, Gordon. 1983. “The Theories of Boleslav Yavorsky.” In Russian Theoretical Thought in Music, ed. Gordon McQuere, 109–64. Ann Arbor, Mich.: UMI Research Press. —————. 1983. “The Theories of Boleslav Yavorsky.” In Russian Theoretical Thought in Music, ed. Gordon McQuere, 109–64. Ann Arbor, Mich.: UMI Research Press. Protopopov, Sergei. 1930. Elementy stroeniia muzykal’noĭ rechi [The elements of the structure of musical speech], 2 vols. Moscow: Gosudarstvennoe izdatel’stvo. Muzykal’nyĭ Sektor. Sposobin, Igor. 1994. Elementarnaia teoriia muzyki [Elementary music theory]. Moscow: Kifara. Taruskin, Richard. 1997. Defining Russia Musically: Historical and Hermeneutical Essays. Princeton, NJ: Princeton University Press. Van Der Merwe, Peter. 1989. Origins of the Popular Style. New York: Oxford University Press. Zavlunov, Daniil Yakov. 2010. “M.I. Glinka’s A Life for the Tsar (1836): A Historical and Analytic-theoretical Study.” PhD diss., Princeton University. Zavlunov, Daniil Yakov. 2014. “The ‘Tselostnyĭ Analiz’ (Holistic Analysis) of Zuckerman and Mazel.” Music Theory Online 20, no. 3. —————. 2014. “The ‘Tselostnyĭ Analiz’ (Holistic Analysis) of Zuckerman and Mazel.” Music Theory Online 20, no. 3. Glinka, Mikhail. 1836. A Life for the Tsar (Ivan Susanin), Act 1, Chorus of Oarsmen. Conducted by Alexander Melik-Pashaev. 1947 (1998). Preiser Records 90365, 2 compact disks. Mussorgsky, Modest. 1868 and 1873. Boris Godunov, Act 1, Scene 1, Chorus of Hermits. Conducted by Alexandr Lazarev. 1987 (2005). Long Branch, NJ: Kultur D2852. DVD. Rachmaninoff, Sergei. 1915. All-Night Vigil, movement 12. Conducted by Nikolai Kornev. 1994. Philips 442 344-2. 1 compact disc. 1. In English-language scholarship, mutability has been mentioned by Richard Taruskin (1997, 13, 29, and 133), Blair Johnston (2009, 165–88), and Daniil Zavlunov (2010, 423–67). Only Zavlunov has a more or less complete discussion of the topic; I compare my approach to his below. Gordon McQuere (1983, 117) mentions the variable (or mutable) modes in Iavorskiĭ’s theory. 2. This table and those that follow are my summaries of explanations that, in the writings that I explore, mostly take several pages and sometimes up to an entire chapter. 3. “As many of Iavorskiï’s ideas and formulations were absorbed into mainstream theory, they became distorted, either because individual theorists chose to disregard the original meaning and context of the constructs, or they chose to reconfigure the constructs to suit their needs” (Zavlunov 2010, 429). Zavlunov also offers a brief overview of the concept of mutability. 4. A note on terminology: Peremennost’, a noun, originally appeared in the adjectival form peremennyi (changeable or mutable) in the writings of Iavorskiĭ; the term was made into a noun only by later theorists. The term peremennyi has been translated into English as variable (in McQuere 1978 and 1983) and mutable. 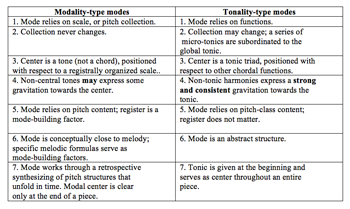 The expression “mutable center,” which I am introducing, is similar to tonic in Western tonal theory. 5. For sources of Iavorskiĭ’s ideas and a bibliography, see Zavlunov 2010, 423. A good summary of Iavorskiĭ’s theory is also found in Ewell 2012. 6. Iavorskiĭ, having been introduced to the writings of François-Joseph Fétis (2008) in the 1890s, was greatly influenced by the Belgian scholar’s notion of the centrality of the tritone and its resolution (Carpenter 1988, ch. 17). 7. The Iavorskiĭ/Protopopov four-note mutable tonic is related to a few recent theoretical notions. The first is Robert Bailey’s (1985) double-tonic complex, which also includes the notes of two third-related triads, but is more concretized in a given piece’s voicing and texture. The second is Joseph Straus’s (1982) tonal axis, which is structurally equivalent and conceptually extremely close to Iavorskiĭ’s tonic. Finally, Peter van der Merwe (1989, 177–83) offers a similar concept called a “ladder of thirds,” which, just like Iavorskiĭ’s four-note tonic, is understood melodically (a “modal frame”), rather than vertically. 8. Regarding the significance of register, Protopopov writes: “If the melody exceeds an octave, the pitch collection of a folk song cannot be determined based on the pitches that occur within one octave” (1930, 2:3). This statement, however, refers to actual pitches, rather than to their modal functions. 9. An analysis more consistent with the abstract modal structure, with its differentiation of function based on register, would posit that the tonic is F4, A 4, C5, E 5, all of the notes present in the song in these specific registers. Solntse zakatalos’ is the only example of any mutable mode in Protopopov’s book, and so it is difficult to say whether further analytical work would always accord with the registral rules of the modal structures. 11. Mazel does not pay any particular attention to the notion of tonal functions, but he uses functional terms (tonic, subdominant, and dominant) in their conventional sense. Although Iavorskiĭ and Protopopov operate with these terms as well, their meaning in most symmetrical modes, including mutable modes, strongly differs from traditional tonal theory. For more on the meaning of subdominant and dominant in Iavorskiĭ, see McQuere 1983 (113–15). 13. Sposobin also discussed mutability in other works, such as the textbook he co-authored with three other writers (Dubovsky et al. 1987). Sposobin was the first to use the word peremennost’ (mutability) as a noun. 14. Berkov does not actually use the word function, but he operates with functional terms, such as tonic and dominant, in a conventional tonal way. 15. Even when the two mutable centers or tonics relate to each other as I and V, a conventional modulatory plan in tonal works, Sposobin emphasizes that the V-functioning side is a Mixolydian mode, rather than a key of V with a raised leading tone (4ˆ in the original key). This idea has to do with the repertoire, for the folk songs Sposobin considers almost never feature accidentals “tonicizing” a new key. In this separation of the mutable mode from modulation with changing pitch collections, Sposobin is extremely close to Berkov. 16. Sposobin’s whole discussion of tonal and harmonic concepts is firmly rooted in the major/minor distinction, which he calls “color” (okraska), and which is also the basis of his understanding of tonality (Sposobin  1994, 89). In contrast, Berkov mentions diatonic modes but never describes them as major or minor. 17. Other sources that expound Kholopov’s views on mutability include his articles from 1986 and 1996, which were later reprinted in Kholopov 2008a and 2008b. There, his fundamental idea of mutability as a characteristic of modality (meaning weakness of center) is confirmed, though the classification is slightly different. 18. My translation of his terms here is necessarily inexact. The exact equivalent of his “lad modal’nogo tipa” would be “mode of modal type,” which is tautological. Therefore, instead of “mode of modal and tonal types” I have chosen “modality-type and tonality-type modes,” a translation that avoids tautology, at least in part. 19. Kholopov explicitly relies on Hugo Riemann’s theory of harmonic functions, which was incorporated into Russian music theory in the 1920s and 1930s (Carpenter 1988, chs. 21 and 29). Moreover, Kholopov’s view of tonality and modality exhibits a remarkable affinity with a similar discussion in another Riemann-influenced theorist, Carl Dahlhaus, who states that modes (in the Renaissance) are constructs based on relationships of tones, whereas keys rely on functions, and therefore chords (Dahlhaus 1990, 154). 20. Sposobin’s typology of mutability, discussed above, occupies the two upper lines, without distinction between the left and right columns; as we have seen, he does not differentiate between tonality and modality. 21. 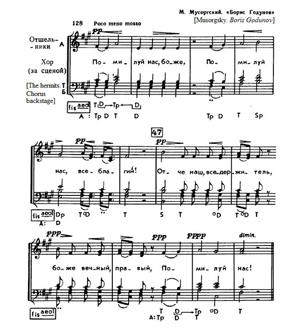 It is significant that both examples bear a relationship to church music (Mussorgsky’s passage, though taken from an opera, is a stylization of church chant). Weakness of tonal center is very typical for Russian liturgical music. 23. For more on the connection between mutability and proto-harmony, see Miasoedov 1998, 50–52. 24. For example, Taruskin (1997, 13 and 29) mentions the “mutable mode,” referring to the relative type, as a notion used by ethnomusicologists. Later, however (pages 133 and 138), he also mentions cases where the two tonics are related by a whole tone. Johnston (2009, ch. 5) concentrates mostly on relative-mutable situations, but includes one exception, where the two centers are E minor and C major (in Rachmaninoff’s “Three Russian Songs,” op. 41). In English-language scholarship, mutability has been mentioned by Richard Taruskin (1997, 13, 29, and 133), Blair Johnston (2009, 165–88), and Daniil Zavlunov (2010, 423–67). Only Zavlunov has a more or less complete discussion of the topic; I compare my approach to his below. Gordon McQuere (1983, 117) mentions the variable (or mutable) modes in Iavorskiĭ’s theory. This table and those that follow are my summaries of explanations that, in the writings that I explore, mostly take several pages and sometimes up to an entire chapter. “As many of Iavorskiï’s ideas and formulations were absorbed into mainstream theory, they became distorted, either because individual theorists chose to disregard the original meaning and context of the constructs, or they chose to reconfigure the constructs to suit their needs” (Zavlunov 2010, 429). Zavlunov also offers a brief overview of the concept of mutability. A note on terminology: Peremennost’, a noun, originally appeared in the adjectival form peremennyi (changeable or mutable) in the writings of Iavorskiĭ; the term was made into a noun only by later theorists. The term peremennyi has been translated into English as variable (in McQuere 1978 and 1983) and mutable. The expression “mutable center,” which I am introducing, is similar to tonic in Western tonal theory. For sources of Iavorskiĭ’s ideas and a bibliography, see Zavlunov 2010, 423. A good summary of Iavorskiĭ’s theory is also found in Ewell 2012. Iavorskiĭ, having been introduced to the writings of François-Joseph Fétis (2008) in the 1890s, was greatly influenced by the Belgian scholar’s notion of the centrality of the tritone and its resolution (Carpenter 1988, ch. 17). The Iavorskiĭ/Protopopov four-note mutable tonic is related to a few recent theoretical notions. The first is Robert Bailey’s (1985) double-tonic complex, which also includes the notes of two third-related triads, but is more concretized in a given piece’s voicing and texture. The second is Joseph Straus’s (1982) tonal axis, which is structurally equivalent and conceptually extremely close to Iavorskiĭ’s tonic. Finally, Peter van der Merwe (1989, 177–83) offers a similar concept called a “ladder of thirds,” which, just like Iavorskiĭ’s four-note tonic, is understood melodically (a “modal frame”), rather than vertically. Regarding the significance of register, Protopopov writes: “If the melody exceeds an octave, the pitch collection of a folk song cannot be determined based on the pitches that occur within one octave” (1930, 2:3). This statement, however, refers to actual pitches, rather than to their modal functions. An analysis more consistent with the abstract modal structure, with its differentiation of function based on register, would posit that the tonic is F4, A 4, C5, E 5, all of the notes present in the song in these specific registers. Solntse zakatalos’ is the only example of any mutable mode in Protopopov’s book, and so it is difficult to say whether further analytical work would always accord with the registral rules of the modal structures. Mazel does not pay any particular attention to the notion of tonal functions, but he uses functional terms (tonic, subdominant, and dominant) in their conventional sense. Although Iavorskiĭ and Protopopov operate with these terms as well, their meaning in most symmetrical modes, including mutable modes, strongly differs from traditional tonal theory. For more on the meaning of subdominant and dominant in Iavorskiĭ, see McQuere 1983 (113–15). Sposobin also discussed mutability in other works, such as the textbook he co-authored with three other writers (Dubovsky et al. 1987). Sposobin was the first to use the word peremennost’ (mutability) as a noun. Berkov does not actually use the word function, but he operates with functional terms, such as tonic and dominant, in a conventional tonal way. Even when the two mutable centers or tonics relate to each other as I and V, a conventional modulatory plan in tonal works, Sposobin emphasizes that the V-functioning side is a Mixolydian mode, rather than a key of V with a raised leading tone (4ˆ in the original key). This idea has to do with the repertoire, for the folk songs Sposobin considers almost never feature accidentals “tonicizing” a new key. In this separation of the mutable mode from modulation with changing pitch collections, Sposobin is extremely close to Berkov. Sposobin’s whole discussion of tonal and harmonic concepts is firmly rooted in the major/minor distinction, which he calls “color” (okraska), and which is also the basis of his understanding of tonality (Sposobin  1994, 89). In contrast, Berkov mentions diatonic modes but never describes them as major or minor. Other sources that expound Kholopov’s views on mutability include his articles from 1986 and 1996, which were later reprinted in Kholopov 2008a and 2008b. There, his fundamental idea of mutability as a characteristic of modality (meaning weakness of center) is confirmed, though the classification is slightly different. My translation of his terms here is necessarily inexact. The exact equivalent of his “lad modal’nogo tipa” would be “mode of modal type,” which is tautological. Therefore, instead of “mode of modal and tonal types” I have chosen “modality-type and tonality-type modes,” a translation that avoids tautology, at least in part. Kholopov explicitly relies on Hugo Riemann’s theory of harmonic functions, which was incorporated into Russian music theory in the 1920s and 1930s (Carpenter 1988, chs. 21 and 29). Moreover, Kholopov’s view of tonality and modality exhibits a remarkable affinity with a similar discussion in another Riemann-influenced theorist, Carl Dahlhaus, who states that modes (in the Renaissance) are constructs based on relationships of tones, whereas keys rely on functions, and therefore chords (Dahlhaus 1990, 154). Sposobin’s typology of mutability, discussed above, occupies the two upper lines, without distinction between the left and right columns; as we have seen, he does not differentiate between tonality and modality. It is significant that both examples bear a relationship to church music (Mussorgsky’s passage, though taken from an opera, is a stylization of church chant). Weakness of tonal center is very typical for Russian liturgical music. For more on the connection between mutability and proto-harmony, see Miasoedov 1998, 50–52. For example, Taruskin (1997, 13 and 29) mentions the “mutable mode,” referring to the relative type, as a notion used by ethnomusicologists. Later, however (pages 133 and 138), he also mentions cases where the two tonics are related by a whole tone. Johnston (2009, ch. 5) concentrates mostly on relative-mutable situations, but includes one exception, where the two centers are E minor and C major (in Rachmaninoff’s “Three Russian Songs,” op. 41).